This museum has a few qualities that set it apart from other historic homes that we've visited. First the museum was used as a movie set. 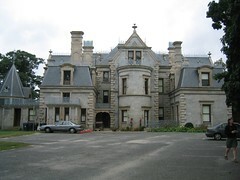 Scenes from “Stepford Wives” were filmed in various rooms of the mansion. We were thrilled to discover this, and ate up the stories the guides had of the filming as it occurred only a year or so before we arrived. The house itself has had a hard history. Originally built by Mr. Lockwood, it was a grand example of a European style home, fashioned by many skilled immigrant craftsman. Mr. Lockwood fell on hard times and the mortgage was sold to Mr. Mathews. The house is huge and must be a beast to heat. In the 1950s, the house was given to the city. It would break a preservationist's heart to hear the tales of abuse the building suffered while used as municipal building. During that time, many things were broken or stolen from the house. The interesting and beautiful part of the story was that in 1971 the house was designated a Historic Landmark and the arduous process of restoring the home to its former beauty is still underway.